Law banning late-night calls to prayer 'won't pass', says haredi lawmaker, telling Arab MK haredi parties oppose Muezzin Law. The coalition government’s two haredi factions will oppose a bill aimed at preventing mosques from using loudspeakers during their night-time calls to prayer, a senior haredi lawmaker reaffirmed Tuesday. In recent years, Knesset members have pursued legislation to crack down on the nightly disturbances caused by the Muslim call to prayer, which is blasted five times a day – including the “fajr” prayer before dawn and the late-night “isha” prayer. The use of mosque loudspeakers to broadcast the calls to prayer have created serious disturbances for non-Muslim neighbors and nearby communities. The latest bill intended to block the noisy late-night muezzin calls was drafted by Moti Yogev (Jewish Home) and Robert Ilatov (Yisrael Beytenu). While the law appeared to have wide backing in the coalition, haredi MKs objected to the proposal, initially due to the concern that a broad ban on outdoor loudspeakers at houses of worship could affect synagogues use of PA systems ahead of the Sabbath. Later, however, United Torah Judaism MKs revealed they had cut a deal with Arab lawmakers to block the “Muezzin Law” in exchange for support on other pieces of legislation. "We do 'business' with them so that they will support laws important to the haredi public," UTJ MK Menachem Eliezer Moses explained earlier this year. Speaking at a meeting of the Knesset’s Finance Committee Tuesday, Finance Committee Chairman Moshe Gafni (UTJ) affirmed that both his party and the Shas faction would block the Muezzin Law, which is slated for review by the Constitution, Law and Justice Committee later on Tuesday. 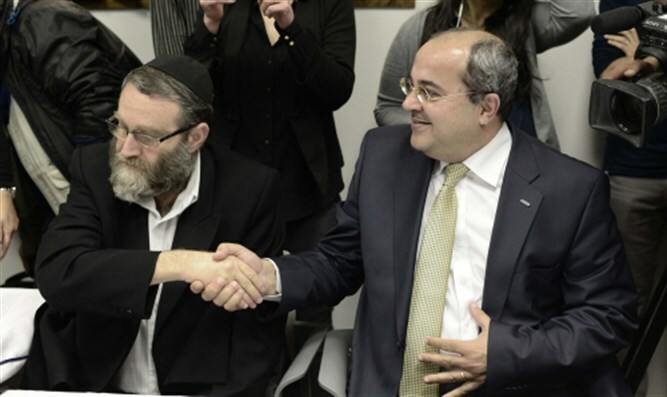 During the meeting, Gafni promised MK Ahmed Tibi (Joint List) - a former advisor to the late terrorist and Palestinian Authority chief Yasser Arafat - that both haredi factions would vote against the Muezzin Law. Tibi had pressed Gafni on the issue during Tuesday’s meeting. “We agreed that this bill won’t progress forward,” continued Gafni. Gafni argued that existing noise laws, which prohibit loud noises after 11:00 p.m., are sufficient, and need to be enforced properly by police.